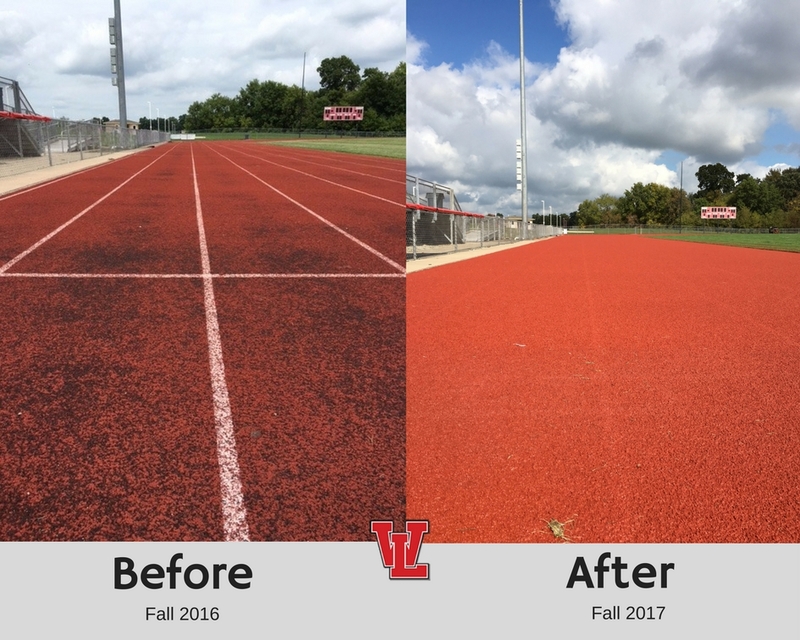 Resurfacing our track: It is recommended to have a track resurfaced every 7-10 years. We made it to 11 years. Thus, we used a portion of the sinking funds to maintain our track to get WLPS through another generation of use. You can see the difference in the before and after. Lines will be added shortly. LED light conversion: Technological advances in the past ten years have made it possible to change lighting systems in high energy use areas within our district. You might notice better lighting in hallways, which will soon be in our gyms and our pool. In addition to better lighting, we are consuming drastically lower levels of electricity, saving money. Baseball/softball field renovations: New drainage lines and an improved infield fill have been added in the past weeks. This project is not yet complete, but we fully expect to have the complex ready for spring use. Next steps for our sinking fund? School staff are going back to the priority list to re-evaluate it. We know high need projects still exist. Our elementary school has a good deal of exterior work slated to begin in the spring, for example. WLPS will share plans with the Board of Education in the coming months, and new timelines will be established. Finally, one very important note regarding the sinking fund: As a result of the sinking fund, WLPS has avoided having to spend approximately $40,000 from our general fund in the last year alone. Our facilities were in need of major repairs, and normally, we would’ve had to draw from our general fund to keep us operational. But because of the support of our community, we did not have to. Thank you, again, for your continued support of our students and our school. This community has made it a great day to be a Trojan. 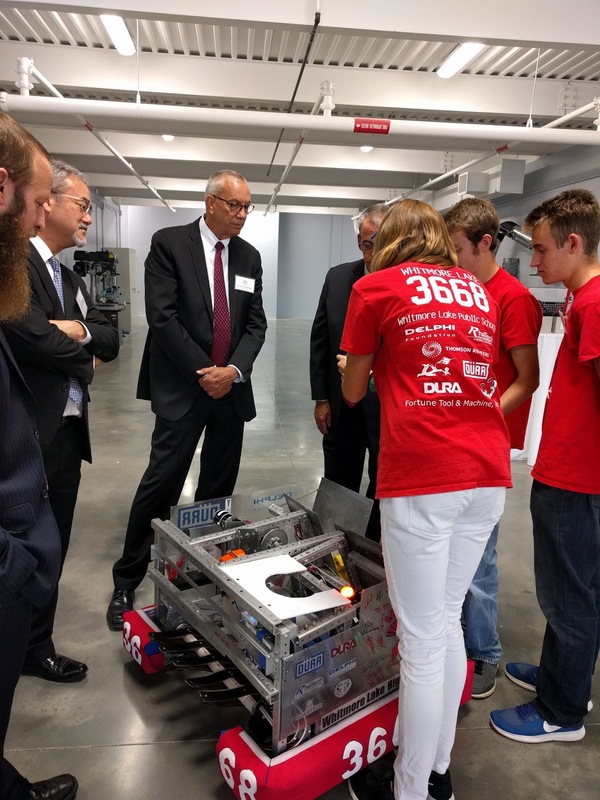 Last Monday three members of our high school Robotics Team were invited to the open house of an engineering firm Arvin Sango new to Whitmore Lake. They were asked to speak to attendees about Robotics/STEM offerings at WLPS and demonstrate what their robot does. And if that wasn’t enough, Arvin Sango awarded our students with a $5,000 donation as a first-time corporate sponsor of our WLPS Robotics program! In exchange for their generous sponsorship, Arvin Sango will have their logo on our team t-shirt, team banner, and the robot itself. The students in attendance included WLHS senior and team captain, Hunter Fanson; WLHS junior and team co-captain, Jordan Craven; WLHS junior and programming captain, Matt Schwennesen. In addition to sharing their robot with those in attendance, these Trojans had the chance to interact with executives from Arvin Sango, Toyota and Mitsubishi. While the high school season doesn’t officially begin until January 2018, our middle school season is in full swing. Their game this season is called “Relic Recovery” in which they will compete starting in November. Have a student interested in joining one of our robotics teams or interested in supporting the program? Contact Jeff Schwennesen 734-255-7828 or xjschwen@gmail.com. We sincerely thank Arvin Sango for supporting our robotics team and opening their doors to our students. You can check out more photos from the day HERE. Go Trobots! Take some time and think about what you have accomplished in the last 30 minutes. Want to know what a group of 2nd graders did yesterday in 30 minutes? They learned five new Mandarin Chinese words. Count them. 1…2…3…4…5. Or more appropriately, 一… 二… 三… 四… 五. As part of our new pilot-program, WLPS students preschool through 2nd grade are learning the Mandarin Chinese language and exploring Chinese culture. I call this program “new,” but really it has been in the works for over two years. When I first started as Superintendent of WLPS back in December 2014, one of my initial steps was to meet with a group of parents to pick their brains on why they love WLPS and what they wanted to see improved, changed, expanded in the future, At the secondary level parents indicated they wanted to see our Advanced Placement program expanded. At the elementary level they wanted art back and a foreign language added. This sentiment was reiterated in a survey sent to all Elementary parents last fall as part of our District Improvement Plan. It was a need we were anticipating. It fell in line with our district goal of expanding and improving programs and options, and knowing the benefits of learning other languages earlier in life, we found a way to make it happen. We began a partnership with BCC International Education Group who provided us our new teacher for the fall, Qian Xu. Qian Xu comes to us from Lanzhou, located in Northwest China. She earned her Bachelors of Art from Gan Su University of Technology and her Master of Art degree from Northwest Normal University in China. This is her second time teaching in the United States. In 2010 she taught Mandarin Chinese to 3rd and 4th graders in Kentucky. While she misses her family and friends and “hot pot”, a genuine Chinese dish, she is excited to work with our students. “I love to feed kid’s curiosity,” she said. “They are so eager to learn something new. When they have so many questions about China or Chinese culture, I love to answer and can’t wait to share as much as I can. It is very important for kids to understand the diversity of cultures in this world–not everyone speaks the same language or has the same culture as they see around them,” Qian Xu shared. She has her own classroom at WLES that she has transformed. “I want the students to feel like they are in a different country when they come into my room,” she explained. Students have spent the first few weeks learning about Chinese culture and yesterday was their first language lesson which was to learn to count to five in Mandarin. By the end of the 30 minutes, many of Ms. Schneider’s 2nd graders could do just that. It was exciting to see how quickly they absorbed the lesson. It is an exciting program to watch come alive and we look forward to sharing the continued success of it as the school year continues.